Join Tim for intensive and fun four-day Pottery Camps at the acclaimed Stone Quarry Hill Art Park. Each hands-on workshop will offer you more than 24 hours of instruction and practice. Building on the success of the 2016 and 2017 Camps, Tim is offering eight camps in 2018! Three new themes for 2018 are Teapots and Pouring Vessels, Surface Decorating, and, Alternative Firings. Prior to camp, Tim gathers input from each potter on their goals so he can tailor the curriculum. He will demonstrate and then let potters practice immediately after, offering feedback when it is requested. The four Camp themes are described below. Throwing Intensive – Tim starts with the basics of centering and pulling walls because they are the foundation of all the forms he will demonstrate. From cylinders we progress through mug forms to vases, before moving on to bowls, lids and plates. Trimming for each form is explored as well as throwing off the hump, production basics, throwing large, assembling parts, finishing, and many other topics. 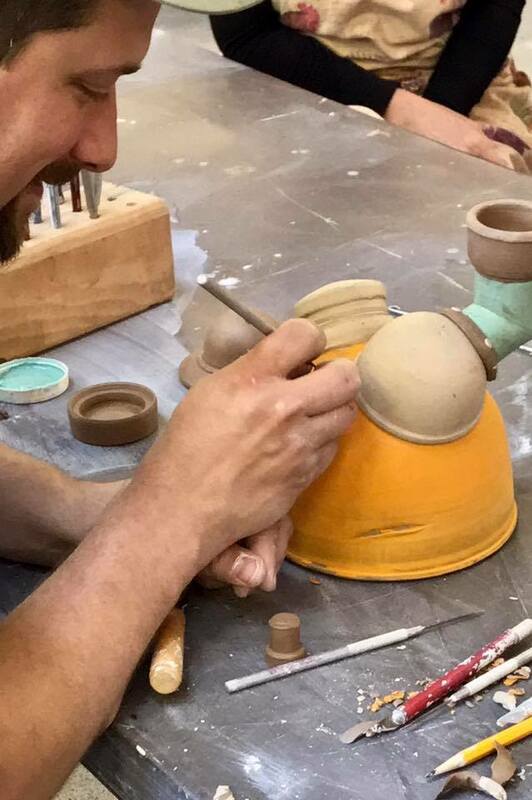 Teapots & Pouring Vessels – Tim’s complex teapots, oil cans, cruets, and, cream and sugar sets are successful because of throwing and assembling techniques that he has refined over his career. Potters will use those techniques to throw and assemble their own forms. Surface Decorating – Decisions about surface decoration start with our clay choice and whether we manipulate it with colorants or other additives. At each stage of making – shaping, leather hard, bone dry, bisque, and, even glazed – we have many choices to express our ideas and voice. Using both thrown and hand built forms we will explore more than 25 techniques. Alternative Firings – If you enjoy the excitement of working with fire to see results immediately, this camp is for you. Potters will ship or transport bisque ware from their home studios and together we will transform it. Our raku experiments will include horsehair and naked techniques, as well as more traditional glaze options. Pit and saggar firing will keep us busy too! 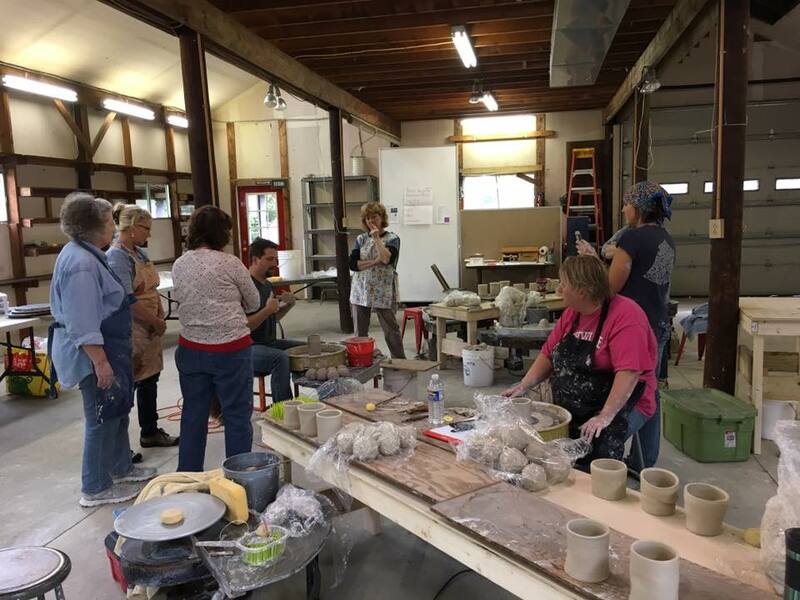 Optional Field Trip – to Clayscapes Pottery, Inc. REGISTRATION: Reserve a spot by e-mailing timseeclay@yahoo.com with the session number you would like to attend. You will receive an invoice with instructions to make a payment to a Google Wallet account. Your registration is not complete until payment is received. Before making plane reservations, await email confirmation that we have a minimum of 6 potters per session enrolled. A maximum of 10 potters, 8 residential and 2 commuters, will be enrolled in each camp. Spaces fill up fast and are secured on a first come, first served basis. A waiting list will be developed in case a cancellation opens a spot. A refund, minus a $50 processing fee, will be sent in the event a potter cancels more than 6 weeks prior to the first day of the workshop. No refunds will be issued after the six-week cut off date. We will send additional details once your registration is finalized. There are sessions in September and October if those are fall enough. How can i tell if there are any spaces open for any camps? We would love to come to a workshop and meet you in person. We actually learned how to throw pots by watching you on YouTube! We have not thrown anything for three or four years since we live in South Florida now and don’t have an air-conditioned studio, but I’m hoping that we can pick it back up quickly. I am sure that we can do that and even advance with your instruction and guidance. Do you have any openings for August or September?